This plugin excels in giving you full control over the visibility of your a post. By default, any post you add to your WordPress blog will become the topmost post, and will show up immediately on the front page in the first position, and similarly in category/tag/archive pages. Sometimes, you want to create a „low-profile“ addition to your blog that doesn’t belong on the front page, or maybe you don’t want it to show up anywhere else in your blog except when you explicitly link to it. This plugin allows you to create such „hidden gems“. The posts will disappear from the places you choose them to disappear. Everywhere else they will show up as regular posts. In particular, permalinks of the posts still work, and if you generate a sitemap, with something like the Google XML Sitemaps the post will be there as well. This means that the content of your post will be indexed and searchable by search engines. Hide a page on the front page (homepage) only. Hide a page everywhere in the blog (hiding the page in the search results is optional). This means, technically, whenever pages are listed somewhere using the get_pages filter, this plugin will kick in and either filter it out or not according to the options you choose. The same rules apply regarding permalinks and sitemaps as they do for regular posts. „WP Hide Post“ plugin is a great tool in your arsenal for SEO optimization. It allows you to add plenty of content to your blog, without forcing you to change the nature and presentation of your front page, for example. You can now create content that you otherwise would be reluctant to add to your blog because it would show immediately on the front page, or somewhere else where it would not belong. It’s a must-have feature of WordPress. Please enjoy this plugin freely, comment and rate it profusely, and send me feedback and any ideas for new features. Please visit the plugin page at ScriptBurn.com, and feel free to leave feedback, bug reports and comments. That’s it!! Now whenever you edit a post/page or create a new one, you will see a small panel on the bottom right of the screen that shows the applicable options. It enables you to create posts/pages that can be hidden (temporarily or permanently) from the homepage, feeds and/or other places. The post/page will remain accessible normally through other means, such as permalinks, archives, search, etc… and thus will remain visible to search engines. How can I make a post or a page private so that no one can see it? If you want to make a post/page completely private you don’t need this plugin. 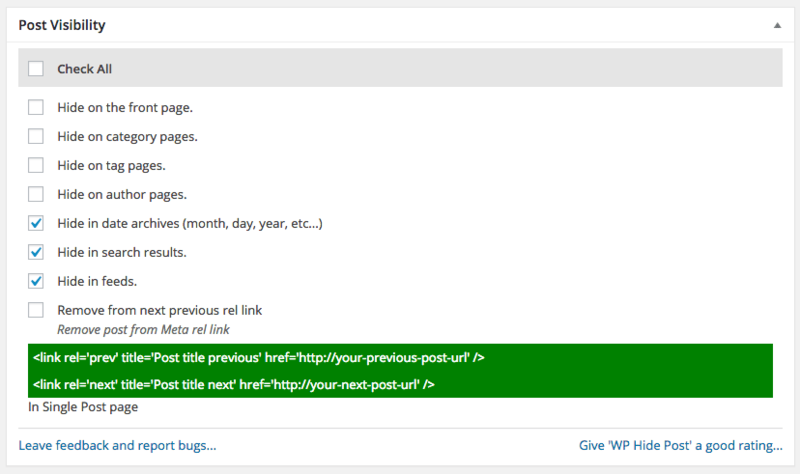 WordPress supports options such as private and/or password-protected posts/pages out of the box. Can I make a post or a page *hidden* for a while, but then make it normal again? Yes. The hidden flags are just another set of attributes of a post/page. They can be added or removed at any time, just like editing anything else about the post. I have an idea to improve this feature further, what can I do? Please contact me on my blog ScriptBurn.com. I’m looking forward to hearing any suggestions. I just found something that doesn’t look right, do I just sit on it? By all means no! Please report any bugs on my blog ScriptBurn.com. I’d really appreciate it. This is free software and I rely on the help of people like you to maintain it. I’m worried this could reduce my search engine ranking. Is it gonna? Not at all. On the contrary. All the content you include on your blog, even though it’s not directly accessible from the homepage for example, it’s still to be available when search engines crawl your site, and will remain linkable for those individuals that are interested in it. Furthermore, if you use some sitemap generation plugin (like the Google XML Sitemaps plugin I use on my own ScriptBurn.com) all the content will be published to web crawlers and will be picked up by search engines. In fact, this plugin will make your SEO more effective by allowing you to add content that you wouldn’t otherwise want to show on your homepage. I used the ‚WP low Profiler‘ plugin before. This one sounds just like it. This plugin is the new version of the ‚WP low Profiler‘. The name has been changed, but the functionality and codebase is identical. In fact, once you activate this plugin, it will upgrade the existing ‚WP low Profiler‘ plugin and take its place. The last version of ‚WP low Profiler‘, 2.0.3, corresponds to the first version of ‚WP Hide Post‘, 1.0.3. I already have ‚WP low Profiler‘ installed and activated. What’s going to happen to it? ‚WP Hide Post‘ will take the place of ‚WP low Profiler‘. Once ‚WP Hide Post‘ is activated, ‚WP low Profiler‘ is deactivated and deleted. All its data is imported first, so you won’t loose any data. I already have ‚WP low Profiler‘ installed but it’s not activated. What’s going to happen to it? Ditto. It will be deleted. If you had any existing data (if you had it active before) the data will persist. Why did you change the name of ‚WP low Profiler‘ ‚to WP Hide Post‘? ‚WP low Profiler‘ wasn’t descriptive enough of the functionality of the plugin. Being ‚low profile‘ could mean many things to many people. It was hard to find and many people who needed it didn’t know it exists because of that. No support – but they trick you into monthly payment. I was reluctant to download this because it's not been updated for 2 yrs, but I installed it anyway. And so far from all I can tell it works exactly as described. I selected "Check All" to hide it from all locations of my site, and it passed all tests. Yet I could still get to the page when I added the url to a new browser window! I'll post an update if I find any errors that come up with the current version 5.03 Gutenberg. But so far both Thumbs UP! Übersetze „WP Hide Post“ in deine Sprache. Fix to include Blog page when Hide on the front page option is checked. Added Quick Edit option for post and page in post list page. Added Bulk Edit option for post and page in post list page. Added Search for hidden post option in post list page. Added a new column “Hidden On” in post list page. Added “Check all” Option in hide post widget to select all options at once in post or custom post type page. Added a setting option in setting page where you can select what on which post type you want to show hide post widget. Reduce the number of SQL queries to hide pages to a single queries for all pages, rather than one query per page. Bug fix: bulk update clears „Visibility Attributes“. Split code into separate files.